A visitor prepares to examine more than 100 years of Navajo weaving in The Durango Collection at the Wheelwright Museum in Santa Fe. The exhibit is on loan to the museum by the Fort Lewis College Center of Southwest Studies. 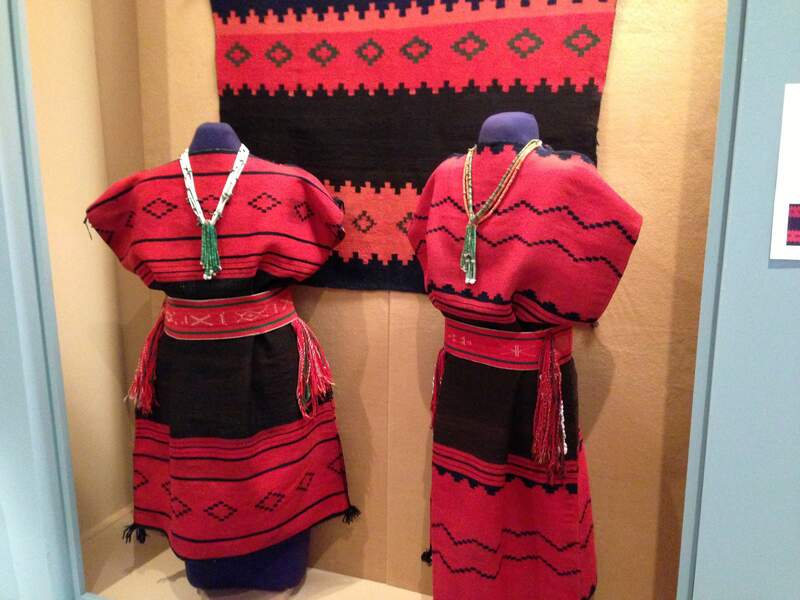 Formal Navajo women’s wear is displayed in The Durango Collection at the Wheelwright Museum in Santa Fe. D.Y. 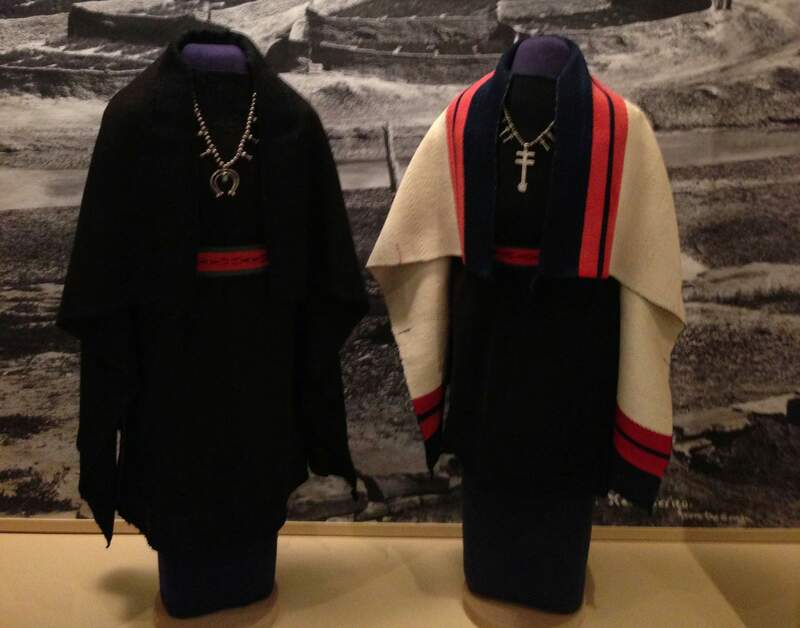 Begay dressed the mannequins of The Durango Collection to authentically portray how the clothing was worn. SANTA FE – When you enter the Wheelwright Museum, you can wrap yourself in a rare historical moment. Three Chief’s Blankets from distinct phases of Navajo history are suspended in the eye of the museum. The blankets come from The Durango Collection, a remarkable assemblage of Native American textiles that are normally housed at Fort Lewis College in the Center of Southwest Studies. The Santa Fe exhibit is part of the Center’s increasing effort to collaborate with other museums. Before the Wheelwright opening, the Center orchestrated collaborative exhibits in Boulder at the Avenir Museum, in Flagstaff at the Museum of Northern Arizona, and at the Anasazi Heritage Center in Dolores. A number of other outreach programs are underway in the Four Corners as well as planned participation in gallery exhibitions at the National Museum of the American Indian in Washington, D.C. The three Chief’s Blankets are shown along with a number of other textiles, some jewelry and splendid photographs that have a story to tell. With the exception of the first Chief’s Blanket, the exhibit is essentially limited to works from 1860 to 1880. Text panels reveal that indigenous weaving dates back 2,500 years, long before the Spanish conquest or the introduction of upright looms even earlier. The tradition continues today in traditional and contemporary streams, but the exhibition focuses on the late 19th-century period of turmoil and change. The American Civil War and its aftermath included massive Westward expansion and occupation. Among other things, the railroads increased trade and transformed indigenous weaving. When the Navajo were forced into exile at Bosque Redondo, the disruption resulted in scattered herds, drastically depleted resources, incalculable suffering and new ways of experimenting with and making textiles. The exhibition colorfully mentions mythical beginnings. Taught by Spider Woman, the Navajo began weaving with tools she provided: sunshine, rain and lightning. These natural elements found their way into designs, beginning with the simplest banded blankets and eventually emerging as Eyedazzlers, elaborate zigzag patterns created with contrasting colors. Textile historians have classified Navajo weaving into three periods. The Classic Period lasted from 1700 to 1875 and produced mostly clothing. The Transitional, from 1875 to 1900, reflected the tremendous adjustments during a drastic time of change in which weavers experimented with new materials and new designs. The Rug Period brings Navajo weaving up to the present where native textiles have become highly sophisticated and now reach an international market. The Wheelwright exhibit concentrates on the Transitional Period. The wearing blankets are mostly displayed on mannequins, as they should be. Enveloping life-size figures, the blankets show how seemingly simple designs make bold and dramatic statements. Contemporary Navajo weaver D.Y. Begay assisted the Center’s Curator Jeanne Brako and the Wheelwright staff in dressing the figures. Several displays have multiple figures, male and female. Two elegant black women’s dresses date from 1865 and 1870. Both have a manta, or shawl wrapped around the shoulders. One is black, the other of natural white wool. Look closely and you’ll see elegantly embroidered borders, black on black. In addition, Begay added appropriate silver jewelry to complete a highly formal and ceremonial look. The tradition continues today: “I have a formal Navajo dress that I wear for special occasions,” she said. Organizers have wisely put the three Chief’s Blankets in the central kiva, including the First Phase, a simple banded blanket, dating from the first half of the 19th century with natural wool colors. The Second Phase dates from about 1870 and shows natural wool colors plus indigo blue and red from raveled trade cloth. The Third Phase, circa 1875, is more elaborate, woven with natural colors, indigo blue and raveled red plus commercial wool yarn. Together they tell a silent story of utility, transformation and adaptation to a new world. “The Durango Collection,” through April 14 at the Wheelwright Museum of the American Indian, 704 Camino Lejo, Santa Fe. Hours: 10 a.m. to 5 p.m. Monday through Saturday, 1-5 p.m. Sunday. Free Admission and parking. Call (505) 982-4636 or visit www.wheelwright.org for more information.